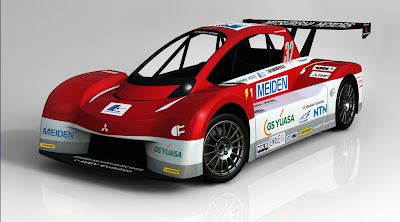 Mitsubishi Motors Corporation (MMC) will enter two all-electric vehicles (EVs) in the Electric Class of the legendary Pikes Peak International Hill Climb. MMC will be aiming for victory in the Electric Class with the i-MiEV Evolution, a specially-prepared competition version based on the i all-electric vehicle. MMC is also entering a regular production i in the event. The i-MiEV Evolution uses the same motor, drive battery and other major components as the production i and has been developed in cooperation with several partner companies including Meidensha Corporation and GS Yuasa Corporation. The i-MiEV Evolution has been developed to showcase MMC's advanced EV control and EV component technologies. MMC will use the technical knowhow garnered through the i-MiEVEvolution's development and usage for the development of future EV models with superior durability and reliability. Driving the i-MiEV Evolution in the Pikes Peak event and also serving as team manager will be Mr. Hiroshi Masuoka - the first Japanese driver to post consecutive overall victories in the Dakar Rally. The Mitsubishi i will be piloted by Ms. Beccy Gordon, a winner in the Score International Off-Road Racing Series. Hiroshi Masuoka began his Dakar Rally campaign in 1987 and became the first Japanese driver to post consecutive overall victories in the event when he won in 2002 and 2003. Currently Masuoka works at Mitsubishi Motors where his many duties include vehicle development, the training of company test drivers and the running of test drive sessions and other events both in Japan and overseas. Masuoka had the following to say before the event: "Given the tough driving conditions that Pikes Peak is known for, I'm really keen to show people the world over those electric vehicles are capable of gutsy motive performance and excellent handling in addition to their superior environmental performance." Beccy Gordon is an American off-road racer. She grew up in a family in which her father, brother and sister have all been successful racing drivers, as is her husband today. Gordon herself is an experienced driver having raced in a wide spectrum of motor sports and she is also a motorsport spokesperson. Gordon commented before the event: "I'm really happy to be able to drive the Mitsubishi i in the Pikes Peak race and am looking forward to giving it my best in an electric car, the type of vehicle that is set to become a major player in motor sports in future."